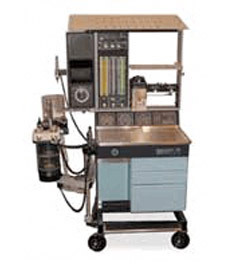 The Ohmeda Modulus II" Anesthesia Machine comes standard with a 7810 ventilator that integrates oxygen, volume, and pressure monitoring and has optional pulse oximetry and endtidal CO2 modules. Additional peace of mind comes with the battery back-up of the ventilator and monitoring. Choose from several different vaporizer options: "Ohmeda Tec Series "Penlon Sigma Delta Series Drawer pack configurations may vary from picture.